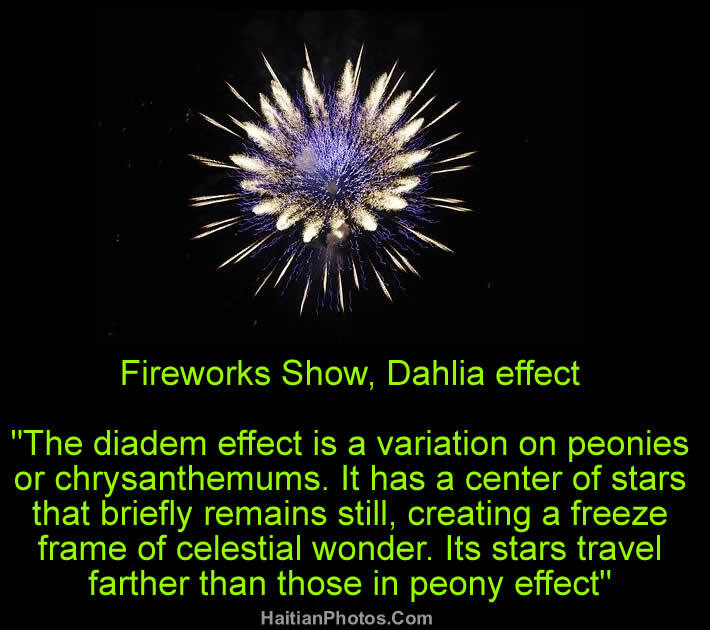 The diadem effect of Fireworks is a variation on peonies or chrysanthemums. It has a center of stars that briefly remains still, creating a freeze frame of celestial wonder. Its stars travel farther than those in peony effect. The earliest documentation of fireworks dates back to 7th century during the Tang Dynasty (618-907 AD) in China, although it was originated or invented much earlier, some 2,000 years ago, by a Chinese cook who by accident mixed three common kitchen items, saltpeter (potassium nitrate, then a common kitchen seasoning), charcoal and sulphur in a bamboo tube. Some sources give the credit of inventing fireworks to a Chinese monk named Li Tian (about 1,000 years ago) during the Song Dynasty and every year, Chinese people celebrate the invention of the firecracker on April 18th, by offering sacrifices to Li Tian. In 1560, the European chemists managed to make gunpowder as explosive by experimenting with the ratios of these same ingredients: salt peter 75%; charcoal 15%; and sulphur 10%.